Serve this easy to make stir-fry over rice or noodles and if you like, sprinkle with toasted sesame seeds. Change it up and use Ontario boneless chicken or beef grilling steak. In small bowl, whisk together soy sauce, 3 tbsp (45 mL) of cold water, cornstarch, honey, mustard and chili garlic sauce. Set aside. 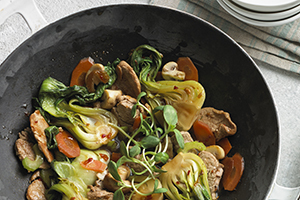 In wok or large deep skillet, heat 1 tbsp (15 mL) of the oil over medium-high heat. Stir-fry pork in batches until browned; transfer to bowl. Add remaining oil to wok. Stir in mushrooms, carrots, celery, garlic and ginger; stir-fry for 3 minutes. Add 3 tbsp (45 mL) of water. Cover and steam for 2 minutes. Add bok choy; cover and cook until bok choy leaves begin to wilt, about 2 minutes. Stir min pork with juices and reserved sauce. Stir-fry until sauce thickens, about 1 minute. Stir in sesame oil and top with pea shoots.